Here is a mother swan and her three chicks. Awwww. How cuuuute. This is the Grand Canal west of Dublin. The Grand Canal was built in typical Irish fashion: It started with good intentions in 1715 and due to delays and setbacks, it was not completed until 1804. Seriously, it took 89 years to complete. 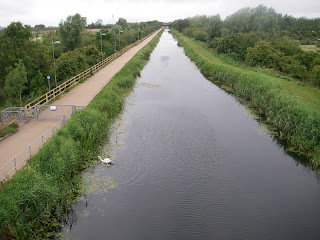 The Grand Canal connects Dublin to the River Shannon. Aww, look!!! How sweet. thanks for sharing. This is so magical. Great way to start the day over coffee. Lovely! I think the Grand Canal was originally built to carry cargo across the country, and to serve as a means of transportation. I know that narrow boat holidays are a big thing over in Wales, however I have yet to see any barges or narrow boats on the canals in Ireland. The locks are all well maintained by Waterways Ireland and the canals seem clean & clear of weeds. It seems like a missed opportunity. The swans are the only folks using the canal system these days. Awww, cute. While I am here, I want to say how much I am enjoying your blog and learning about Ireland...I look forward to every post. I am a long-time reader of your mother's blog (it was always fun that she was out in Carmel, CA and I was in Carmel, IN), and Sara's blog as well. It is such fun to read all about your experiences in Ireland...my father's mother was Frances O'Brien from the county Armaugh and she and her family brought with them all their Irish ways and love when she came to America with her family as an infant in 1911. Thank you for the glimpses into Irish life! One of the things I love about my walk into work is that I can see swans, pheasants, woodcocks, rabbits and foxes on my way into work. It's easy to forget that I'm living in the capital city sometimes! I love how we are all getting quaint little history lessons about Ireland through your entertaining and endearing blog entries! 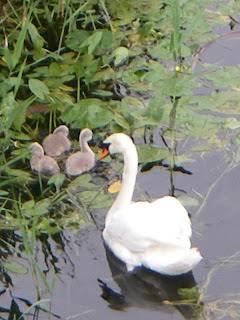 The swan family is indeed "awwwww-ful".